It was after seeing a video for Steve Ramsey’s router table build that I decided I would make one final change (an improvement, even) to my newly-complete table saw/router table station before I attempt to clean it up ready for selling. Steve’s videos are always inspirational. His videos on YouTube are probably my favourite and have been for the past year. 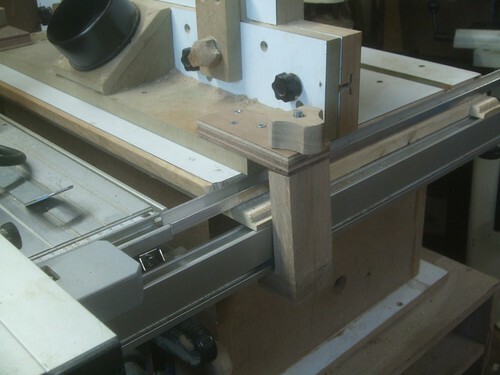 Modestly, Steve admits that he cannot accept much credit for the idea behind the clamps he’s made for his router table fence but it’s the kind of genius thinking that I believe we all can learn from. 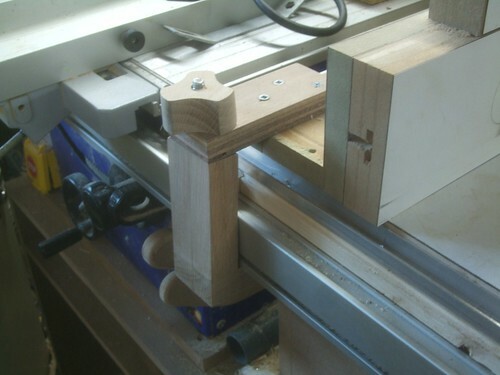 For starters, I’ve never been too satisfied with the clamping system on my old benchtop table. A cut a pair of grooves in the top and, using two short lengths of threaded rod (M8 studding) with a Bristol lever on one end and a sliding nut on the other, I was able to lock the fence in position without any play or movement. Problems began to arise whenever I wanted to remove the fence. I’d have to unwind the Bristol levers and try to catch the nuts as they fell, without losing them. After building this table in to a right-hand extension for my table saw, these sliding nuts became even more inaccessible. You’d need snake-like fingers in order to feed the nut in to its slot on the right-hand side! Previously, I’d thought about using some cheap G-cramps but, where I’ve added those triangular braces to the rear of the fence, this simply wasn’t practical, without much of an overhang of the table’s top. Not only that but, the full travel of one lever would be fouled by one of these triangles – very frustrating indeed! So, the first thing I did (after removing the current fixing method) was to knock those bits of MDF out of the way with a few sharp raps from a hammer. 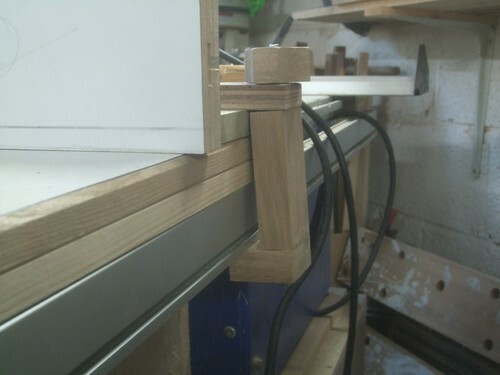 My new clamps are made up from scraps of oak and I’ve advise you to stick with any hardwood offcuts you may have. Softwood might also be okay but, I’m reluctant to suggest MDF or even plywood, as screwing in to and boring through either of these man-made materials can result in a failure of its structure (splitting), especially when your components are only 50mm (2in) wide. If they look a bit odd, it’s simply because my fence isn’t long enough to overhang the extremities of my router/saw station. Either that or, it’s because of the deep-section rails they need to reach under. To get around the first issue, I used a short scrap of 18mm plywood (didn’t want to cut up a second length of oak) and screwed this down securely to the base of the main fence (could’ve glued it as well, for added security). Down through the vertical sections runs a length of M8 studding and a shorter length of oak is screwed to the bottom end of this, so it hooks underneath the fence rails. That vertical section is cut just a couple of millimetres short, so that the effect of tightening the wooden knob forces the wooden ‘lip’ on the end to bite up on to the aluminium rail. There’s an M8 nut embedded in to the lower end of the wooden knob and also, at the bottom end of the vertical part. Here, you’ll also find a nylong locking nut to prevent the thread from turning as the knob is secured. That’s about all there is to it! Dead simple to make and very effective in operation. Once they’re tightened, I cannot budge the fence on my own. It needs some serious ‘persuasion’ to move even a fraction of a millimetre! As a further refinement though, I may attempt to cut a slight notch from the inside of the lower ‘lip’, so that it almost ‘hooks’ on to the under-edge of the rail, where it’s currently distorting slightly, as you can see. Then again, I did drill the holes slightly oversize (9mm) so that the thread would pass through with ease. I’ll certainly be considering something very similar for my next router table and I hope you will, too. 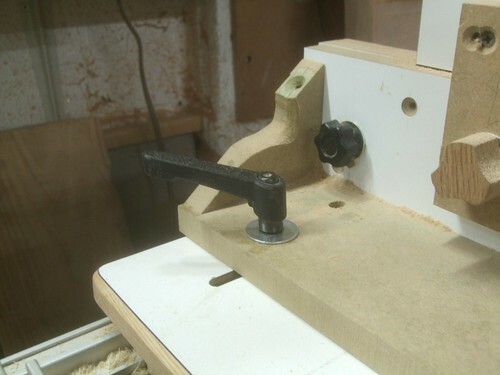 I was once faced with the decision to make or buy a router table. Since time is money in my shop, I figured it would be cheaper to buy a table. I got a Kregg router table and love it! 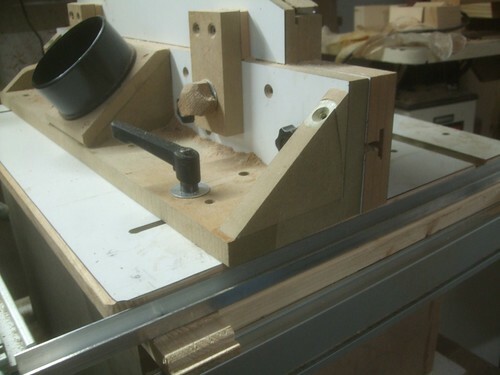 Clamping the fence at the edges of a router table is always better than through slots or inset T-tracks. You can remove the fence in an upward direction and the table surface has no additional traps for debris and potential catching points for the workpiece. I recommend Bill Hylton’s book ‘Woodworking With the Router’ as the best, most practical and comprehensive manual on the subject.